"Well, that does it," Alirx said, slapping her hot-off-the-press copy of The Neopian Times on the table, rattling the fragile porcelain plates that balanced on top. Her pale ears, covered by an unruly mop of violet hair, twitched with irritation. "What does it?" Jefo asked absentmindedly, not taking his eyes off the syrup-stained pancakes on his plate. Spongy pieces flew from his mouth, falling across the table like the snow outside the window. Alirx picked a piece of pancake out of her fur and pointed at the newspaper. "This story!" Jefo shifted his lanky Gelert self so he could peer over at the title. "A Life Without Love," he read slowly. He glanced back at Alirx. "It's a Pound story. So what?" She raised an eyebrow. "So what? That's exactly what. It's another Pound story." She flipped through a few more pages and then jabbed the new headline with her paw. "Here's another one." 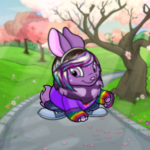 "One Day at A Time: One Neopet's Pound Journey," Jefo read. "Another one?" He forked another heap of jumbled pancake into his mouth and leaned back in his chair, examining his sister. "I don't get it." "Hold on." She backed away from the table, dropped to her knees in front of the sofa, and reached underneath it, digging through layers of dust and forgotten Petpets and who knew what else. She fished out another aged copy of The Neopian Times. Alirx flung the newspaper down on the table, dust bunnies and all, rifling through the pages and finally shoving the newspaper in Jefo's black-and-white spotted face when he looked back at his food. "Gah!" he spat, eyes widening in horror at the bizarre picture printed at the top of the story. 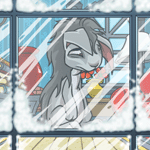 In it was a Neopet, obviously suffering from Watery Eyes, as its streaming and bloodshot face revealed. "Past the Abandoned Door," he read dutifully. "Another Pound story," Alirx hissed. She flipped the page. "And another. And another." She shook her head angrily. "They're all the same!" "But there are so many!" Alirx cried, startling Jefo out of his pancakes. "There's a Pound story in every issue of the newspaper, for Fyora's sake! So many, and they're all the same. Don't people get tired of reading them?! Don't pets realize that there have already been so many Pound stories published? Don't the editors of The Neopian Times understand this?" "Calm down," Jefo said. "Jeez, take a breath." Alirx glared at the headlines. "I'm sick of this," she said. "All of the stories are exactly the same. There's got to be a reason for this, Jefo. Is the Pound really like this?" Jefo shrugged. "How would I know? How would you know? We've never been pounded. Katy would never do that to us." "I know, I know," she said, brushing fur out of her face, but an idea was forming in her mind. "But I want to get to the bottom of this." "This is a bad idea," Jefo said, glancing over his shoulder. "Jeez, Al—"
"Shh," she whispered, leaning over the open drawers. "We're not hurting anyone. This is completely fine. It's not like we're breaking the law or anything." "If it's fine, why are you telling me to shush?" he asked. "Hurry up. The bell's about to ring." "Relax, we have plenty of—ah, here it is!" Alirx reached into the drawer and withdrew a folder bulging with paper—thick sheets, thin sheets, multicolored sheets, crumpled sheets. She tucked it under her arm, and the two of them turned to the door when a figure crossed the doorway. In fact, hundreds of figures—tiny figures. Swarms of young Neopets, racing to get out of Neoschool as fast as they could, now that the exit bell had rung. "How are we going to get out now?" Jefo groaned. "Look for Cimm," she said. "We have to pick her up, anyway. Do you—there she is. Cimm! Hey, Cimm! Over here!" From somewhere in the crowd, a tiny baby Wocky with fur sticking up every which way and a patched Hasee Backpack slung over her shoulder looked up, ears perking at the sound of her sister's voice. She waded through the sea of Neopets, narrowly avoiding being trampled, and trundled up to her siblings. "Hey," Alirx said. "We thought we'd pick you up today, since—um, since we were stopping by." Cimm turned her head quizzically. "We wanted to try the food," Jefo supplied. "Because—uh—"
"Neoschool food is supposed to be great," Alirx added, rubbing her stomach enthusiastically. "And it was. Yum!" "You've obviously never been to Neoschool!" a nearby Neopet cried out, passing by. Alirx rolled her eyes and fit the folder more snugly in the crook of her arm. She glanced down the hallway to make sure that there were no teachers, and then, when the throng of stampeding children had thinned somewhat, stepped out into the corridor. "Let's go," she said, to Jefo and Cimm—"I have business to take care of." First on the list—a list that Alirx may or may not have actually supposed to be looking at—was a Grarrl that went by the name of Xxx5_43q. "How do you pronounce that?" Jefo asked, peering over her shoulder. "He liked being called Exie," she said. "Exie, that's what we called him. It was awful when we had substitute teachers, though—they'd always try to pronounce it, and that usually didn't work out too well." Alirx's paw ran down the page as she scanned the information section. "Look—he still lives in Neopia Central. By the Rainbow Fountain!" "I'm going to go drop by," she said. "You take Cimm home." "Wait a second!" Jefo cried, raising his eyebrows. "Why do you get to do the fun illegal reporting while I'm stuck at home with a kid that doesn't even talk?" "It's not illegal!" Alirx insisted, even though her face had colored significantly. "You stole a list of pounded Neopets from Neoschool," Jefo said. "This is a list that's from seven years ago. They don't need it anymore. And I did not steal it—I'm borrowing it, for investigative purposes. I'm going to send it back with Cimm later. They're going to get it back." Jefo rolled his eyes. "Whatever you say. But I'm not staying home while you get to go out and talk to X-5-whatever his name is—"
She narrowed her eyes. "You do realize this is going to be very businesslike. Professional, like a Neopian Times interview. I'm going to ask a few questions to find out what Pound life is really like. And I'm going to write a real article, so Neopia will know what it's really like behind bars." "Behind bars? The Pound isn't jail. Now you sound like you've been reading too many—"
"That's enough," Alirx groaned, snapping the folder shut. "Are you coming or not?" "Again, I think this is a bad idea," Jefo said, as the three of them waited on Exie's doorstep, waiting. They looked like an odd group—a royal Usul with a strange gleam in her eye, a nervous spotted Gelert, and a silent baby Wocky with eyes the size of Tobbie fruits. Alirx was trying, and failing, to find a pocket in her dress to conceal the folder in. "What's so bad about this idea?" she asked. "I know Exie. I used to go to school with him. I ate lunch with him every day. I played tag with him on the playground!" "Yeah, and that's great," Jefo said, "but what if he doesn't want to talk about it? Even if those stories are completely made up, the Pound can't be the most wonderful place in Neopia. He probably wants to pretend it never happened." "I doubt it. Exie was always—"
"What if he wants to know where you got that folder?" he interrupted. "What if he wants to know how you found his address?" Inola's worried reply was cut off, however, by the door opening. Alirx and Jefo sucked breaths in as an enormous Grarrl—painted Christmas in accordance with the falling snowflakes and the wreath hung from the door—filled their vision, looming so large that his tiny green elf hat nearly knocked against the top of the doorway. Muscles gleamed under his tough, green-striped skin; his teeth shone sharp and white. He looked down at the three of them, and then his eyes fixed on Alirx. "Hi, Exie," she said feebly. "I, uh, guess you don't remember me. I look a little different now, anyway. I'm—I'm Alirx. We used to go to school together?" "Of course!" he exclaimed, so loud that he nearly knocked the hat off Alirx's head; "Ally! I remember you—from Neoschool." He shook his head, beaming. "How could I have forgotten? Ah, and you brought some friends." "My brother and sister," she said, relief audible in her voice. "Your brother and sister," Exie repeated, shaking Jefo's hand and patting Cimm's head. "Great to meet you." He looked back at Alirx. "What brings you here?" "We were hoping to ask you a few questions, if that's all right," she said. "I—about your childhood. For a Neopian Times article. I'm writing one," she added quickly, voice speeding up in time with her nervousness; "I'm—I'm doing some investigative reporting. Not that I'm—well, yes, I guess that makes me a reporter. I'm a reporter! And I want to ask you some questions. Um, about your childhood." Exie cocked his head to the side quizzically, but stepped back to allow them all inside. Warm air swallowed them up; a faint aroma of baking chocolate-chip cookies lingered in the air. The house was decorated cheaply but brightly—tinsel woven around the walls, metallic Christmas ornaments clinging to the ceiling. "I hope you realize," he said, leading them into what turned out to be a comfortable, cozy living room, "that I didn't have a very exciting childhood. It probably won't be very interesting to your readers. I mean—"—he gestured for the three of them to sit down—"I spent my whole childhood in the Pound." "Exactly," Alirx said, eyes gleaming. She picked a pen out from inside her pocket, but fumbled around for a piece of paper before finally deciding to use the back of Exie's file report. She looked back up. "That's exactly what I want to ask you about. The Pound." "So when were you pounded?" Alirx asked, pen poised to write. "I hope that's not an offensive question. I mean—if you don't want to talk about it—"
"No, no," Exie said, shaking his head. "It's fine. Don't worry about it." "So... so, yes, when were you pounded?" "Since... since the beginning," Exie said, sounding a little surprised to hear his own answer. "My owner was a newbie, of course. Any experienced owner would have picked a better name than mine." Alirx nodded, pen scribbling across the page. "Tell me about your experience in the Pound." "I had a lot of experiences there. What do you want to know?" Alirx shrugged. "I mean... what was the food like? The rooms? The pets? What were the conditions like? Go over a day in the life." "A day in the life," Exie murmured, shaking his head. "To tell you the truth, it was so long ago, I hardly remember it. The food wasn't too awful—I guess it was slightly better than Neoschool food, but—"
Alirx glared at him, giving him a good elbow in the ribs, and turned to look at Cimm, who was giggling, too. She poked her sister, then turned back to Exie. "Sorry, Exie. Go on." "What else is there? For me... with a name like mine, what were the chances of being adopted? I stayed there for a long, long time. It was my home." He looked at Alirx and sighed. "I'm sorry. I don't have anything good to tell you. It was such a long time ago!" "That's all right," Alirx said. "So, uh, when did you get adopted, then?" "Adopted!" Exie's face brightened. "I got adopted a while back. Years ago. It's funny—I got adopted by a newbie, too. Well—back when my owner, Miguel, was a newbie. The day it happened, I couldn't believe it—I didn't know what was happening. I'd forgotten that there even was a possibility of me being adopted. then..." He sighed, drifting into the memory. "Miguel came right up to my room and pointed at me." "Why would he adopt you?" Jefo asked, and winced as Alirx elbowed him in the side again. "Sorry, Exie," she said apologetically; "My brother here isn't the—well, isn't the brightest bulb—"
"It's all right," Exie said. He looked at Jefo. "I was thinking the same thing. Why me? Turns out that Miguel doesn't care about names. Or colors. He was a newbie, so I figured he just didn't know any better, and I'd get thrown back in as soon as he learned, but it's been years, and it hasn't happened. He just doesn't care!" Exie beamed. "I have a few brothers and sisters. We aren't exactly rich, but we're happy." He looked at Alirx, Jefo, and Cimm. "I mean, we don't need to eat at Kelp and live in Faerieland to be happy. Miguel gets us omelettes for most of our meals, and jelly for dessert, but last year he painted me Christmas as a surprise. This year, he's going to paint my sister's Petpet plushie." He smiled. Alirx nodded thoughtfully. "I see." "And that's not all," Exie said; "I have some cookies baking that'll be just about ready by now!" "No, we couldn't," Alirx began. "We couldn't possibly intru—"
"Aw yeah!" Jefo exclaimed. "Thank you so much!" While he and Cimm gobbled the warm cookies, spraying pieces of gingerbread all over the clean kitchen counter, Exie turned to Alirx. "I'm sorry I couldn't be of more help, Ally," he said quietly. "I know you wanted a Pound story, but instead, you got my story." "That's okay," Alirx said. "It's—"
"You know," Exie interrupted; "If you really want a Pound story—authentic and gritty and all of that jazz, I know the perfect place to look for it." "The kingdom itself," he said. "The Neopian Pound." "For the third time today," Jefo said, standing beside Alirx and Cimm in a crowded line—"this is a bad idea." "Now, you're just abusing that phrase," she said, running a paw through her fur in an attempt to make it neater. "Taking that folder—yeah, that probably wasn't the best. Talking to Exie—wasn't really very useful, but it was nice to see him again. And this... this doesn't look so bad." "Next!" the pink Uni at the desk called, and the mismatched trio stepped up to her. Alirx's pen was firmly tucked behind her ears, and she had another file turned over so she could write on the back of it. "How may I help you?" the Uni asked. "Hi," Alirx said briskly, twiddling the pen for greater effect. "I'm writing an article for the Neopian Times, and I need to interview a few pounded pets. It's about... conditions here. Very big, very important. I think you'd find it helpful if I were on your side." "I see." The Uni looked at Jefo and Cimm. "And who are they?" "That's my, uh, cameraman. And she's my... um, my intern. Yup. She doesn't talk much. Strong and silent type." The Uni cast a bemused look at the baby Wocky before turning back to Alirx. "You can go right ahead," she said, glancing at the doors. "It's going to be a little rowdy, though. Pound release is just about to start." The Uni nodded at a Skeith guard standing by the door, who opened it up. "I hope you find what you're looking for!" "Jeez," Jefo remarked, glancing around as they jostled their way through the crowd—"A little rowdy is understating it." In front of the pounded Neopets' cages were hundreds of Neopian owners in various states of agitation. Some of them were shouting, and some of them were grinning, and some of them looked close to tears. Alirx squeezed her way through he crowd, followed by her siblings, and found herself squashed against the bars of a pink Chia's cage. "Hey," she said. "Hey, you. Yeah, you. Let me in?" The Chia's eyes widened with disbelief, but he slid the door open, and the three pets stumbled inside. "Are you here to adopt me?" he asked, sounding like nothing more insane could ever happen. His eyes bulged; his hefty paws quivered. "No," Alirx said, and regretted it slightly as the Chia's face fell. "I mean, we're from the Neopian Times. We're here to interview you. About Pound conditions." She held up the files. "I'm writing a story. Well, an article. About what the Pound is really like." "You did all that research?" Alirx glanced at the files, and back at the Chia. "I—uh—"
"There are ten Pound stories in every paper," the Chia said, momentarily distracted, screwing up his nose. "Exactly! And I'm going to write an accurate one." He turned his head to one side. "Say, that's a new one. You know, last week, I read one sob story about a Neopet who was pounded four minutes after being created. Supposedly. But that's not even possible." He sighed. "Writers these days. They just want a good sob story. The public loves sob stories." "It's true," Alirx said. "But this story's going to be real. So tell me, what's your name?" "Jimmy," he said. "Well, you can call me Jimmy. You probably wouldn't be able to say my real name." "Wait a second," Jefo said. "You're painted! You're pink! You're an avatar pet. Why don't people want you?" Jimmy sighed. "I'm stuck," he said. "No owners can see me. My cell is just about invisible here." He looked at the ground.. "I've been in here for years. Let me tell you, it gets really, really boring. It's not even the doom-dungeon the stories make it out to be—that would be too interesting. It's just boring. You wake up, you stare at the ceiling, the Soup Faerie brings lunch, and then you wait until dinnertime. Go to sleep, repeat. It's... tiresome." He shook his head and yawned. "I wish I'd get adopted. Even if my owner was just going to abandon me again. It'd be a nice break from... this." "But—" Alirx's pen faltered—"That can't be it, can it? It can't just be boring. Why are people so obsessed with it?" "Some people have sadder stories than others," he said. "You know, the pets that come in here crying after their so-called-beloved owner abandoned them to make a Poogle or whatever. Me, I'm here because my owner was too lazy to feed me." "But—that's it?" Alirx asked. "That can't be it. What about the emotional journey? The real pain? The sacrifice? The friendships formed in times of hardship?" Jimmy snorted with laughter. "Now you sound like you've been reading too many Neopian Times Pound stories." —Alirx was interrupted as a scream ricocheted through the air and everyone in the cage turned to peer at a crazed Neopian dragging a frightened Unconverted Usuki Usul out the doors, screaming, "I got him! I got him!" The Neopians began to clear out after that, one steady stream moving towards the now-open steel doors, leaving the Pound scattered with sodden hotdog wrappers, crumpled cans of Neocola, and leftover Movie Central ticket stubs. Alirx eyes turned to the pounded Neopets in the cages, who all seemed more relieved than depressed. "What was that?" Jefo asked. "Pound release is over," Jimmy said, yawning again, and falling back into the rocking chair in the corner of the cage. "Now we just get the Pound surfers. They're a little nuts—they run back and forth through the Pound like loonies trying to find the best pets." He shook his head. "Neopians these days." "Jimmy," Alirx said, suddenly desperate—"I need a good Pound story. I've come too far!" "What's wrong with my story?" he asked, disgruntled. "It's... there's no story to it," Alirx admitted, shaking her head. "All you did was tell me that your owner abandoned you because they were too lazy to feed you. I want real pain!" Jimmy nodded slowly. "Well, there's always Stargirl_x_97_," he said. "She's this Christmas Kacheek that's always being adopted because of her color, then pounded because of her name. It's not really a huge deal, but she's a big drama queen. I bet she'll give you exactly what you're looking for. Grit and pain and existential terror and all that." "Perfect," Alirx said, finding a new, clean file to write on. "And which cage is she in, again?" Breakfast at the Neohome was a cheerful, generally quiet affair. On Sundays, hot pancakes were left on the counter, next to a steaming jug of Negg Maple Syrup. In the winter, a fire would be roaring beside the teetering wooden breakfast table, and the three of her pets could watch the snow fall. "Well," Jefo exclaimed, slapping his hot-off-the-press copy of The Neopian Times on the table and rattling the fragile porcelain plates that balanced on top—"Well, it looks like you got published!" "Mm," Alirx said, chewing her pancakes thoughtfully, eyes focused on her plate. Jefo looked at her quizzically, then turned back to the paper. "I thought you'd be more excited," he said. "You risked a visit from the Defenders of Neopia to get this written" Jefo flipped to the articles section, and then cocked his head in confusion. "Wait, I can't see it here. Didn't we get a letter saying it was going to be published in this issue?" Alirx shook her head thoughtfully. "Short stories section." "Oh," Jefo said. "You turned it into a narrative?" Alirx forked another heap of pancake into her mouth and sat silently. Jefo turned to the short stories section. "Again and Back: Tragic Tales of Abandonment and Redemption," he read slowly, struggling to hold back a grin—"You wrote this?" Now the grin was bursting over his mouth in small spots, giving it a lopsided angle. "I was only three days old when my owner pounded me. I was naught but a child, innocent, shrouded in pure, youthful wonder, when the dark doors of the Pound swallowed me up, dank and cruel, taking whatever hope I had and replacing it with vicious hurt and cold, merciless abandonment." Jefo glanced up, tears in his eyes from trying to keep his laughter at bay. "I thought Neopets couldn't be abandoned until they were a we—"
"That's enough!" Alirx snapped. "I know—"
"You turned it into a Pound story!" Jefo cried, laughing so hard the table shook—"You turned it into a Pound story! After you—after you—"
Alirx glared at him through between her paws. "It was the only way to get published," she snapped. "They wouldn't publish the first draft I sent. Said the readers said it was too boring. And I—"
Jefo howled, slapping the table with his paws. "Oh, sweet mother of Fyora, this is—"
"That's enough," Alirx hissed. "It was about as true as I could get and still get in! It's..."
Cimm watched the two of them with large, amused eyes. Miles away, a pink Chia flipped open to the first page of the Neopian Times. He flipped to the first page and groaned.